VSA Vermont presents Engage, a juried exhibition featuring Vermont artists with disabilities. February 26 – April 29, 2012 at the Amy E. Tarrant Gallery of the Flynn Center for the Performing Arts. VSA Vermont, a statewide non-profit organization devoted to arts and disability, is presents Engage, a touring juried exhibition showcasing works of art by Vermont artists with various disabilities. Over the course of this multi-year project, chosen artworks will be exhibited in a variety of cultural venues. Participating cultural venues will be physically accessible and the exhibit, Engage, also will provide accessible program and communication features. 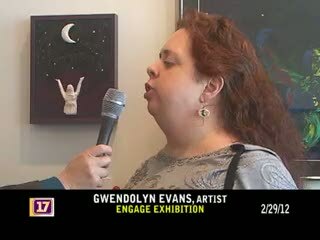 The Engage initiative will offer participating artists opportunities to be featured in statewide publicity, to build larger audiences for their work, and to receive technical assistance in the professional documentation and presentation of their work. VSA Vermont’s exhibit will bring people with and without disabilities together to Engage in the experience of art.